The Maglite was first introduced back in 1979 by the New York native inventor Anthony Maglica. Prior to the Maglite, flashlights were considers to be unrealiable items that was typically thrown away shortly after use due to its inferior quality. When Maglica developed his flashlight, that all changed. By applying his unique patented technology, Maglica revolutionized the portable lighting industry. Mr. Maglica established a hands-on leadership style, as well as a core business philosophy of combining superior quality of all Mag products with unsurpassed customer service. In 1984 the Mini Maglite AA flashlight was launched and set a new standard for personalized flashlights. Often referred to as “A Work of Art That Works®”, the Maglite® and Mini Maglite® flashlights have been honored by the Japan Institute of Design and by the Museum for Applied Art in Germany. Fortune and Money magazines ranked Mag Instrument® products among the top 100 products that “America makes best”. In 1996, the Wall Street Journal referred to the Maglite® flashlight as “the Cadillac of flashlights”, and quoted then-CEO of Apple Computer Gilbert F. Amelio as saying he wanted Apple to be “essentially the Maglite® of computers”. Then in 1988 the smaller AAA version called the Maglite Solitaire was created. 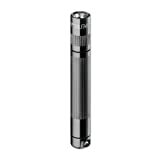 Ideal for many industries and medical applications, its design for keychains, purses and everyday carry has made the Maglite Solitaire a huge success. Although the Maglite Solitaire was created in 1988, it was not until years later when the iconic U.S.-based manufacturing and design company began to explore the possibilities of the LED. Now the Maglite Solitaire LED is a very small single AAA battery powered flashlight. Although it is pocket sized, it is ideal to carry on a keychain and has a lanyard that comes with the flashlight. While several of the AAA style flashlights can hardly put out over 10-20 lumens, the Maglite Solitaire LED has an output of 37 lumens. This light is capable of producing a light beam that is visible for up to 60 yards because of the adjustable focusing head. 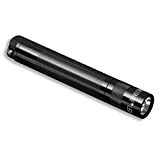 Like all Maglite flashlights, the Maglite Solitaire LED is made from lightweight aluminum alloy, anodized inside and out for enhanced corrosion resistance, manufactured in the great U.S.A., its water resistant and reliable. Bottomline: I have owned several Maglites over the years including a Maglite rechargeable flashlight, Mini Maglite and of course the Maglite Solitaire LED. While they are special in their own way, the little AAA Solitaire is used quite often. In fact, I would have to say that this flashlight is among the best to own.